6,Supports for Multiple Hangout ,Telegram,WhatsApp,Facebook. WE have redefined the Single SIM recharge business in the country with its powerful and cost effective solution - MARS. MARS is the first and probably the only successful solution in the market. 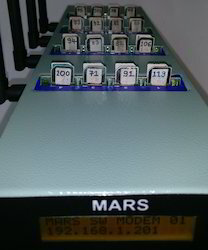 MARS now is deployed with IP BASED modems which makes installation simpler and elegant. IP modems will be connected to Computer through LAN cable, Which is more reliable and makes data communication much faster, as compared to any other interface i.e USB and Serial ports interface. MARS is a prepaid recharge aggregation platform that has redefined prepaid Mobile and DTH recharge distribution. It accepts requests through SMS, GTALK, GPRS (JAVA / ANDROID), ONLINE, WEBSITE and completes recharge through LAPU SIMS, GTALK or APIs. Multitasking architecture coupled with high performance IP modems and switching modems manufactured by us makes the performance of MARS unparalleled. An eight port system of MARS turns in more performance then a 32 port system of the competition. A robust and reliable platform that runs 24 x 7 and has kept pace with the growing and challenging demands of telecom business and regulations. With complete responsibility for hardware and software and quality support MARS has been a source of confidence for its customers to grow their business and extend their reach. 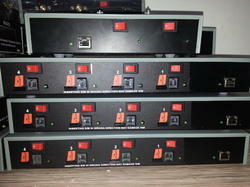 Mars- recharge switching modemwe have developed yet another first in the market – recharge switching modem. This isuseful if there are restrictions in using the same sim for an operator throughout the day or ifyou would like to split the load between sims. Instead of loading lapu balance in bulk (rs. 50000) in one sim, purchase the same balance in 4 simand divide the balance equally i. E. 12500 in 4 sim, modem switches the lapu sim automatically aftercompletion of the specified balance. 16 sim recharge switching modem feature seach recharge switching modem box is equipped with 4 portseach modem port can be provided with up to 4 simsports will start working with the first sim and switch to the next sim after theentered recharge balance for first sim is used. It is also possible to switch based on number of recharges (useful for dth)switching will be done automaticallydaily quota of recharge balance for each sim can be entered and loadedautomatically. Daily quota of available sms for each sim (dth recharge) can be entered and loaded automatically. JAM Software can be downloaded from www.jamsoftware.in. For receiving requests from JAM license should be installed in MARS. MARS Exchange Software is a module allows to send and receive recharge request from MARS Exchange server. You should purchase this module even if MARS already has online module. This Module is helpful, when you find difficulty in arranging Recharge Balance from local distributors, in this case system will forward specified operator recharge request to MARS Exchange for the recharge process. JAM Software can be downloaded from For receiving requests from JAM license should be installed in MARS. 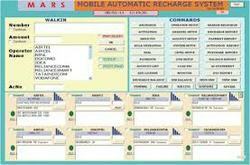 Looking for Mobile Recharge System ?